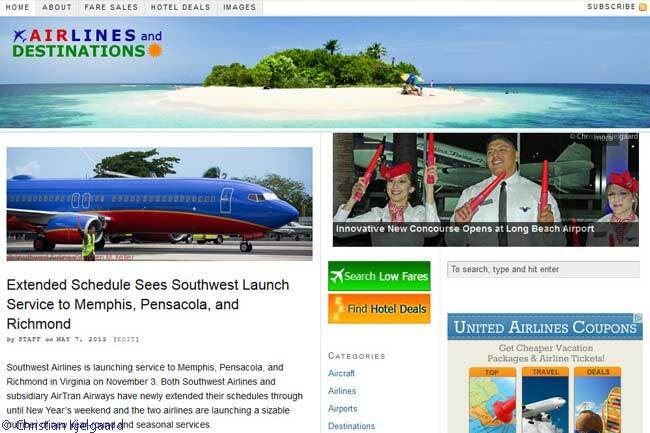 Air and destination travel news and reviews website www.AirlinesAndDestinations.com was ranked 46th among the top 50 North American travel blogs, in a post entitled ‘Top 50 Travel Blogs’ on cisionblog, Cision’s official blog. “The list was created using Cision’s PR Software and blogs are ranked based on our Cision Influence Rating. From here you can brainstorm your own vacation, or reach out to promote your own idea or brand,” note Stone Hansard and Beth Blanchard, respectively Cision’s Internet media supervisor and its electronic media manager. They were the authors of the blog post, which can be found at http://blog.us.cision.com/2013/03/top-50-travel-blogs. Airlines and Destinations, the name by which www.AirlinesAndDestinations.com is commonly known (and which is also the name of its associated Facebook page, at www.facebook.com/airdestinations), marks its fourth anniversary in its current form at the end of July. However, Christian Kjelgaard, the site’s founder and editor, established an earlier, experimental version of the site in March 2009. The Cision travelblog ranking was published on March 28 ‒ practically four years to the day since Kjelgaard founded the initial, much less functional version of www.AirlinesAndDestinations.com ‒ but came to Airlines and Destinations’ notice in early May. “For such a major media services organization as Cision to recognize Airlines and Destinations in its objective, empirically derived ranking of the top 50 travel blogs in North America is a wonderful achievement for us,” says Kjelgaard. Taking the top five positions in Cision’s North American travel-blog ranking are Gadling, Hole in the Donut Cultural Travel, Jaunted, Everything Everywhere and The Art of Backpacking. The ranking also contains such well-known travel blogs as The Cranky Flier, Nuts About Southwest and Carlson Wagonlit Travel’s CWT Savvy Traveler. In addition to its main news and reviews site and its Facebook page, Airlines and Destinations has a Twitter account, @AirDestinations. This Twitter page can be found at www.twitter.com/AirDestinations.